Laboratory extruders are ideal to provide the delivery and response time for low volume or pilot runs. They can be custom engineered for all applications. It can be vital for a manufacturing company to develop new products and test new extrusion processes. Laboratory extruders can be used to reduce time to market. New materials and different formulations need to be tested to find out how they behave when extruded. Sample quantities can be made easily, for testing and evaluation. Ongoing research and development ensures constant improvement and optimization of final products. This can be carried out most easily on a laboratory scale. Versatile small batch table top extruders, with their fast changeover capability, maximize training time. Lab extruders provide the ideal equipment for hands-on experience. 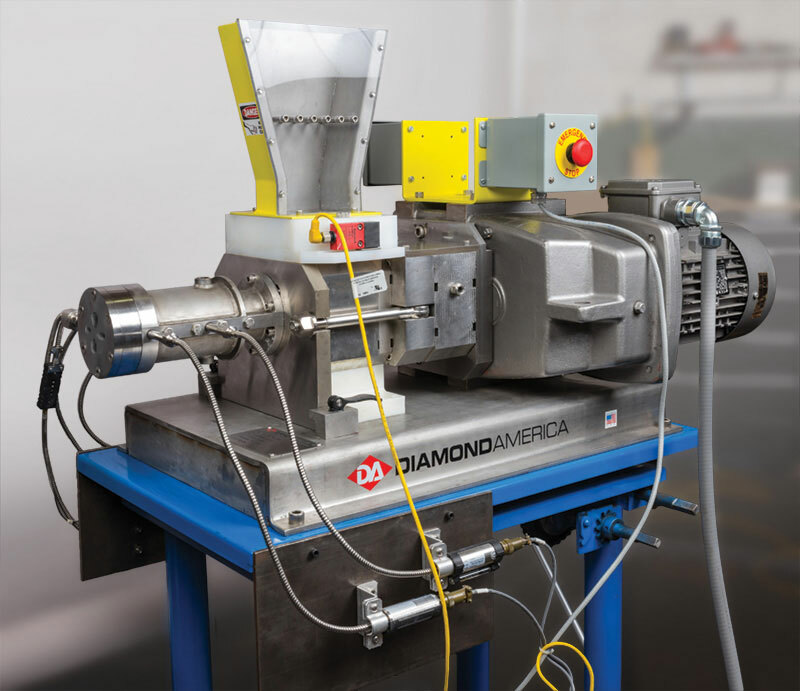 Diamond America Table Top Extruders are a valuable research and development tool for performing operations that are to be eventually scaled up for production. Aside from preventing the diversion of valuable production resources, there are substantial material cost savings to be made by running small batches. The key to using scaled operation is the flexibility of the laboratory extruder. A versatile Diamond America table top extruder provides the opportunity to test and alter processes in order to achieve the best results, prior to scaling. The other factor for successful scaling is ensuring that the material has the exact same experience in the production equipment as in laboratory extrusion lines. Diamond America Table Top Extruders are fully customizable and can be fitted with specialized process control instrumentation to constantly measure and record parameters for exact reproduction. Compact and versatile, yet stable and precise, Diamond America’s table top extruders make ideal laboratory extruders, always proving to be a very profitable investment. Contact us at 330-535-3330 or email us at [email protected] to discuss your unique extrusion needs. The test laboratory boasts several table top extruders for small batch scaled production, as well as full scale twin feed extruders.